I used approximately 45gm 8 ply (DK) 100% wool in green @ approx 100mtr/96 yards per 50gm and scraps of pink, mauve, and light blue. 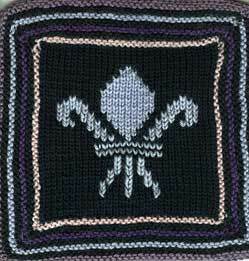 Cast on 31 sts and work the chart below using the intarsia technique. I knit the large lozenge at the top in intarsia and embroidered the rest in duplicate st.
Change colour and knit one row, place a marker, pick up 31sts on the remaining three sides, placing a marker after each 31st st.
Repeat these 2 rounds until you have 43 sts between markers. Cast off and block.